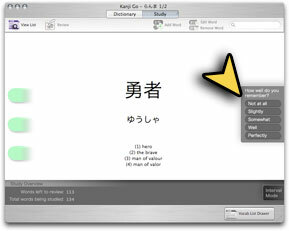 Kanji Go includes several features to aid in memorizing Japanese, all of which are accessible from the Study tab. 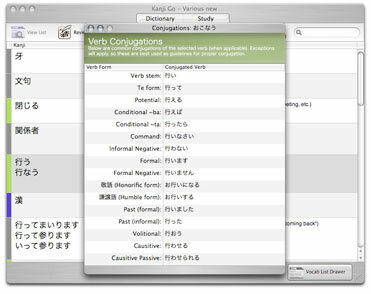 Verb and Adjective Conjugations: Double click the row of any verb or adjective in your vocab list to see its conjugations. When a conjugation is available, the row will have a colored block in the leftmost column. 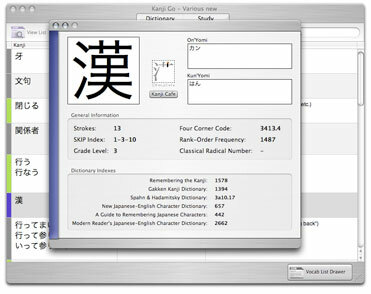 Kanji Detail: Rows highlighted with a purple stripe have additional information available about the Kanji, such as its Readings, Stroke Count, Stroke Order (only available for some Kanji), SKIP index, and dictionary indexes. Double click these rows to view this information. 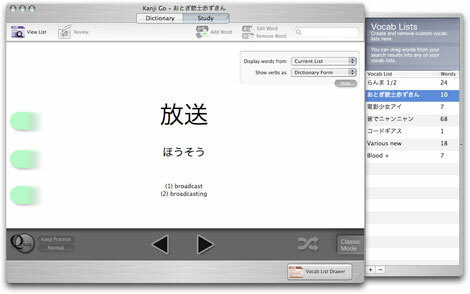 Review: Clicking the 'Review' button will display Kanji Go's flash card and quiz interface, described in the section below. 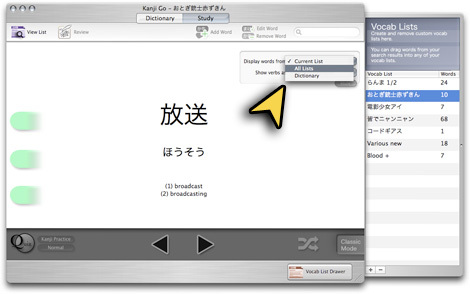 Viewing Words: By default, the review mode will show words from the currently selected vocab list. 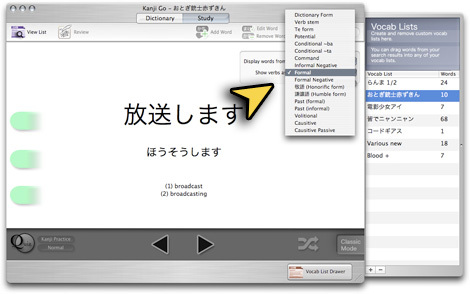 To choose a different list, click its name in the Vocab List Drawer. Click the Left/Right arrows to step through the words, or use their hotkeys (Cmd + LeftArrow) and (Cmd + RightArrow) respectively. Changing the Word Order: By default, hitting the arrow buttons will step through the the current vocab list in a fixed order, starting at the top of the list. Alternatively, you can click the shuffle button in the bottom right to see words in a random order. When enabled, the shuffle button will appear green, and the 'back' (left) arrow will be disabled. Changing the Source: If you want to review multiple vocab lists at a time, you can select 'All Lists' from the 'Display words from:' drop down menu. 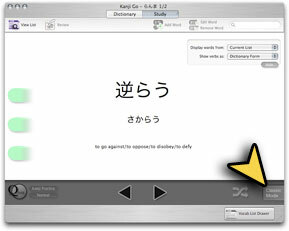 Changing the Verb Form: If you're trying to memorize a particular verb conjugation, you can adjust the verb form shown on the flash cards from the drop down menu visible below. Whenever a verb is being shown, it will be conjugated to match the form you have selected. 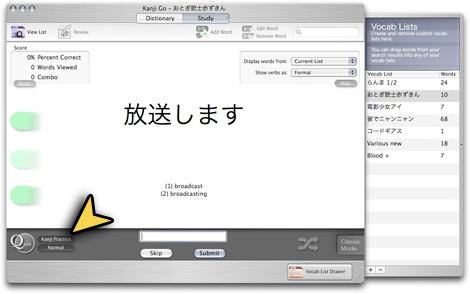 Hiding/Showing Elements: You can choose to hide or show any part of a word's definition (the meaning, kanji, or kana) by clicking on it. Any hidden elements will have a red tab, while visible ones will be green. You can also hide/show elements using the hotkeys cmd 1, cmd 2, and cmd 3- they will hide/show Kanji, Kana, and the Definition respectively. Changing Review Styles: In addition to traditional flash card drilling, where you step through cards at your own pace, you can also use a 'Spaced-Interval' technique. To enter Spaced-Interval mode, click the button in the bottom right corner of the Review area. Overview: Spaced-Interval mode will present words from all your vocab lists at set intervals designed to improve your ability to remember the words. How it Works: In order to calculate when next to show a word, this mode requires that you select, on a 1-5 scale, how well you remember the word. Words that you have difficulty remembering (those that score 3 or less) will be shown within a few minutes, as soon as you finish viewing any cards you haven't yet reviewed. Words you remember well or perfectly will be shown less and less frequently. This technique is ideal for memorizing words that you would like to remember long term. How-To Use: To use Spaced-Interval mode, rate each word you are shown using the five buttons on the right side of the window. If any other words are due for review, they will automatically appear. Your overall progress is visible at the bottom of the window, and a summary is shown once you've completed your study session. If you would like to keep studying, you may return to 'Classic' mode by clicking the button in the bottom right corner of the review area. Quizzing: You can take a quiz by clicking the round quiz button in the bottom left corner. There's no time limit, so you're encouraged to frequently refer back to the original definition until you have it down. Setting the Quiz Difficulty: By default, typed answers only need to be a close match to be counted as correct (2/3 of the characters/letters in the word need to match, and be in the correct order). Optionally, you can set the quiz difficulty to 'exact' for more strict testing. 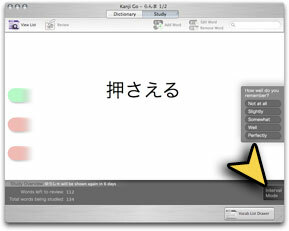 This setting can be found in Preferences on the Quiz tab. 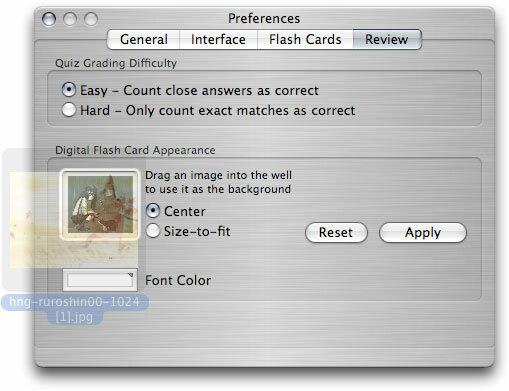 Customizing the Background: You can make the in-app flash cards more interesting by adding a custom background image. To change the background, drag an image onto the well in the preferences window, and hit apply. 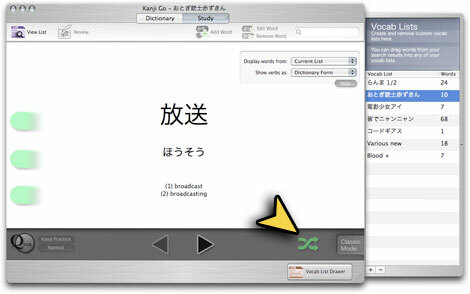 A copy of the image is saved in /Library/Application Support/Kanji Go/, so you may freely move/delete the original image without losing your custom background. 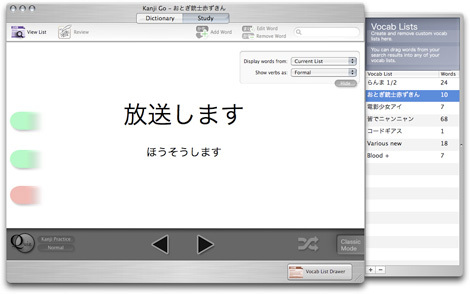 To get more material for flash cards, you can Import and Export vocab lists.